DAWN CHORUS is a colourful assortment of beautiful spring-inspired patterns by the Swedish illustrator Saga-Mariah Sandberg. The collection draws upon the thematic motifs of Nordic nature. 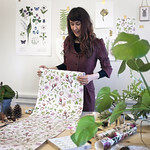 It consists of eight hand-drawn wallpaper designs full of meadow flowers, magnificent roses and Swedish forest berries. The Moss Garden Before Rain - Saga-Mariah Sandberg Interior256 Wallpaper.